I don’t understand Valentines Day. Q’est que c’est, all these hearts? Hearts are a symbol of love. That’s what Valentines is all about. Mais je suis certain that hearts they reside à l’intérieur de tous nos bodies. They do. But they’re still symbols of love. Regardez donc Madame – vraiment en réalité, les hearts, c’est hunks of meat. May I remind Madame, le meat, c’est la cuisine. Ce n’est pas gross. But regarding les hearts, I have seen le vrais chose, le Real Thing. I don’t think you’ve ever seen a real heart, Puff. You eat only kibble. Again Madame is misinformed. 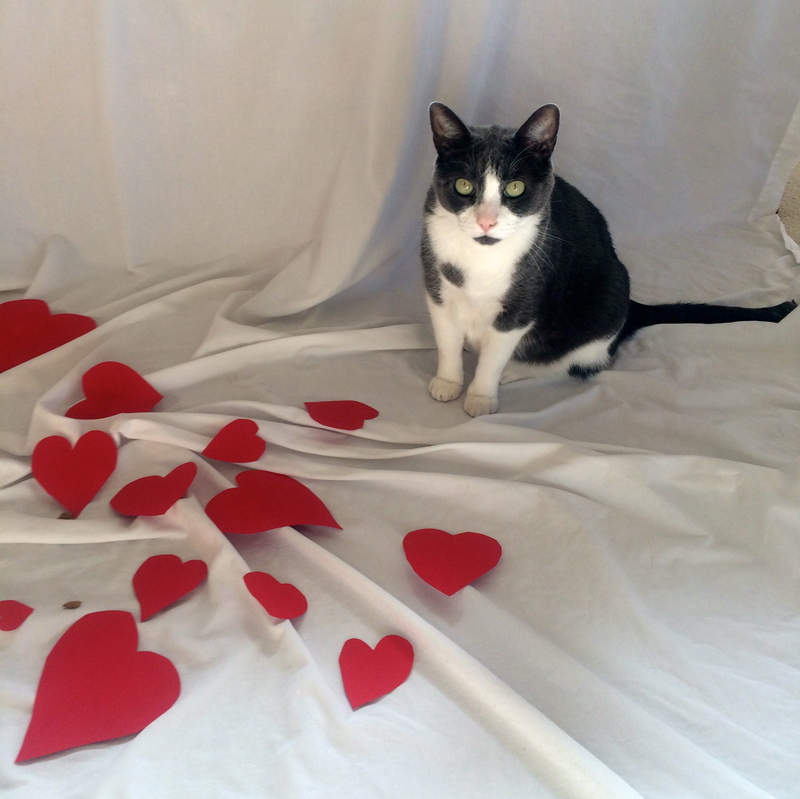 When Poppy stole that squirrel dropped by the Red-Tailed Hawk, its insides were hanging out, and its heart didn’t look anything like these pieces of paper. Ok, ok. That was extremely gross. I don’t even want to think about that incident. Mia and I regarded le excitement through le window. It was only half a squirrel, but still vraiment exciting. Poppy was thrilled. The hawk was even more thrilled when I took that mangled body from Poppy and set it back out for him to reclaim. I must point out, je vous en prie, that the squirrel heart did not look like a symbol of anything. Except peut-être breakfast. Symbols are like that. They can be slippery.